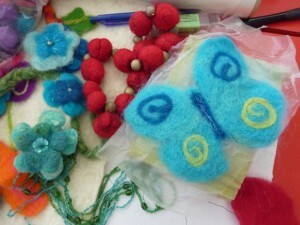 Our friendly Eco-Crafters Club members meet every Wednesday for crafts & a natter. They share their skills – from basic sewing, knitting and crochet, to the more exotic, such as felting, Japanese braiding and peg loom weaving – and learn from each other over a cuppa and biscuits. No skills are required to join the group and membership is open to all including accompanied children – subject to places available. The group is self-led with support from the Environment Centre staff and makes items for sale to raise funds for the club and St Nicks charity. In early 2017 the club gratefully received £1,311 from Ambiente Tapas on Goodramgate – the restaurant had made St Nicks their charity of the month and the money is going towards the club’s costs. Entry: £1 for members, guests are welcome to attend one session for free to see if they might like to join. You can read more about the club on this page and if you’d like to try it out or find out more, please get in touch.